Blackpool Men’s first team recorded their first victory of 2018 with a well-deserved 5-2 win over City of Manchester firsts at Stanley Park. Inspired by the return of former captain Nick Rainbow, looking on from the sidelines after his match was cancelled earlier in the day, Blackpool looked to adopt the tactics that worked well against Didsbury a fortnight ago. However it was the visitor who started the stronger, with the ball barely getting out of the Blackpool half in the opening five minutes. Ben Mortimer twice prevented the Manchester striker from getting a shot off with some excellent tackling around the Blackpool area. Just as Blackpool were beginning to come into the game, City opened the scoring through a penalty corner. Blackpool soon hit back as Rob Dingle picked out Dave Morgan, whose slightly mishit effort bobbled into the net. There was nothing fortunate about Blackpool’s second as they took the lead after 20 minutes. Jay Currey led the counter-attack to combine with Morgan nd set up Andy Mortimer, who swept home. Blackpool suffered another setback, this time in terms of personnel as Rob Abbott was forced off injured with a hamstring tweak, with the evergreen Pete Latimer returning to the heart of the Blackpool defence. Five minutes before the break, Blackpool added a third with Simon Thomas deflecting the ball from Adam Georges reverse effort. The umpires paused to confirm the final touch was inside the area but the goal stood and Blackpool held their two-goal advantage going into the break. Captain Ian Swaine stressed the importance of sticking with the disciplined tactics that worked in the first half and as well as the importance of the next goal. Fewer than five minutes in and it was Thomas who again popped up to flick the ball past the City goalkeeper to open up a three-goal lead. With Blackpool beginning to look comfortable, they switched off at a restart from a long corner and a deflected effort flew up into Latimer’s face. After a lengthy period of treatment, he was helped off the pitch and later taken to hospital for a check-up. With a second central defender injured, Swaine dropped into the back line but was unable to prevent City’s second from the resultant penalty corner. Despite being down to a bare XI, Blackpool continued to push for a fifth to put the game to bed and Morgan provided it 10 minutes from time with a neat reverse flick. 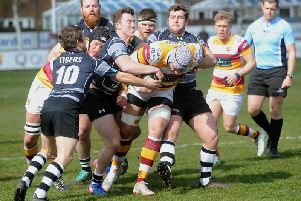 Blackpool still have a mountain to climb in the division to avoid relegation, but at least they have a glimmer of hope as they travel to Winnington Park next week. However, there was no game for the second team because of a frozen pitch. Lytham’s men’s first team were 5-4 winners when they made the trip to West Derby on Saturday. Their attitude was spot-on in the first couple of minutes but they soon found themselves two goals down. However, they started to find holes in the West Derby line-up with penalty corners earned and Shawcross pulling a goal back. A few runs began to create chances and penalty corners for Lytham which saw Shawcross score again. The match was fairly equal by half-time, though Lytham’s appearance as the better and fitter team was not reflected in the scoreline which saw them losing. It was clear though, the umpires were not going to accept any more chat! The game really started to shift into Lytham’s favour as West Derby became increasingly frustrated with umpiring decisions and their waning lead. They started to use the more physical aspects of this non-contact sport but Lytham pressed and earned some penalty flicks, which Shawcross slotted home. Players from both sides also found themselves sitting out of the game for spells after a combination of backchat and rash tackles. With the game tied at 4-4 and eight minutes remaining, Will Stone’s fine challenge was deemed against the rules and saw him sent off for 10 minutes. Lytham duly regrouped, cleared the penalty corner and outran the opposition, only for the ball to hit one of their players on the knee and see them reduced to nine. However, another penalty corner brought another Shawcross goal before the was brought to an end with Lytham victorious. Lytham’s ladies’ first team were 1-0 winners in their game against Longridge. They began well with most of the play taking place on Lytham’s attacking side but the Longridge keeper was in excellent form, ensuring Lytham were unable to convert the chances they created. Longridge attacked hard in the second half, forcing Lytham to defend, but the only goal came via a penalty corner. Emily Adams took the ball onto her left side with a reverse stick shot which slipped past the keeper. A well fought game saw Longridge work hard to break down the Lytham defence but some excellent defending kept them out. The thirds were also in action as they went down 5-0 against a Fulwood side sitting top of the table. An even first 20 minutes were followed by two Fulwood goals but, despite an encouraging team talk at half-time, Fulwood scored three goals which didn’t reflect Lytham’s efforts. Garstang Ladies Hockey Club’s fourth team were 2-0 winners against their table-topping Lancaster counterparts. Team captain Arianna Lowery stepped in as emergency keeper, while Keira Mason also made a welcome return. Garstang started attacking enthusiastically and did so throughout the game, keeping almost relentless pressure on Lancaster. Several early chances were foiled by a competent Lancaster keeper but, on 18 minutes, Hattie Seed intercepted a ball, made a good break, drove into the ‘D’ and fed winger Keira Mason on the post, who knocked the ball home with great delight. Lancaster came back strongly but the Garstang defence of Imogen Colllinson, Rianna Uttamlal and Rachel Orton, led by acting captain Katie Stevens, stood strong and Evie Parkinson started to make high speed runs up the right wing. Seed and Orla McShannon were in superb form in midfield and were well supported by Abbie Mason and Caitlin Ball as the half ended with Garstang 1-0 ahead. Early in the second half, Parkinson came close to scoring in the first minute as Lancaster found it difficult to deal with her sheer pace with the ball. Nevertheless, Lancaster were fighting hard and, after three minutes, they won a penalty corner that was finally cleared by a powerful kick from Lowery. Stevens stopped a powerful Lancaster break and Lowery stood her ground well when a lone wolf broke into her ‘D’ but shot wide of the Garstang goal. On 13 minutes, Parkinson made another good break, and with several players involved in a goalmouth melee, managed to force the ball home for a deserved goal. Pip Chapman played her heart out as centre forward but it was one or those days when the ball just would not fall in the right place for her. Garstang upped their attacks and Parkinson came near to scoring on 20 minutes. Lancaster continued to looked dangerous on the break but Orton warded off any danger. The whistle blew with Garstang 2-0 winners after an excellent game of hockey played in the right spirit by two committed teams.